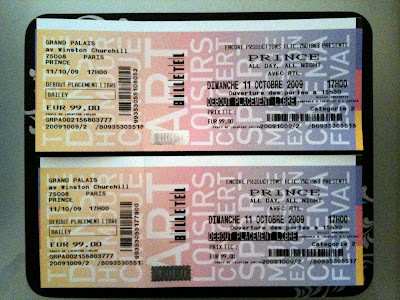 As I explained in my previous post, Prince made a sudden decision on Tuesday that he wanted to have a concert in the Grand Palais on Sunday. They are calling it "All Day, All Night." I showed up at FNAC on Rue de Rennes at 8:58a this morning. It was an easy 15 minute walk on a 60 degree overcast gray morning. I was number 23 in line on the sidewalk. Yes, I counted. The website said the store opened at 9a. It actually opens at 10a, which is also when the tickets go on sale (internet sales begin at 11a), so I waited in line on the sidewalk until 10 when we were let in and we filed down the stairs (tickets sales are always in the basement for some reason) to the ticket counter. I got to the cashier at 10:20 and asked for my options. First, they only allow two tickets per person. Second, there were two times: 5p and 10p. Third, there were two kinds of tickets: floor (i.e. standing) for 99 EUR or seats for 149 EUR. I wanted 5p but seats were sold out already so I took floor. Brittain and Brandon leave Sunday morning. My daughters arrive Sunday morning. I am going to Prince at 5p. I don't know what my daughters are going to do. Check back on Sunday night. I may have pictures, audio and maybe even video posted before the 10p show even kicks off! Oh, by the way, they already had a poster for the concert on the wall at FNAC but I can't find it on the internet.